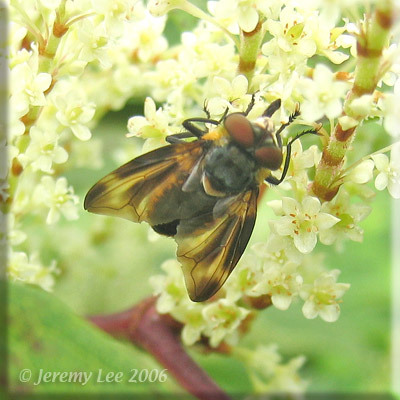 Phasia hemiptera is a tachinid fly found throughout Northern and Southern Europe. It is a strongly sexually dimorphic species, males being more colourful with curved patterned wings. Like most tachinid flies, the female lays her eggs on other insects, the larvae then develop inside the living host, devouring it and eventually killing it. Its main hosts are the forest bug Pentatoma rufipes in the spring, and the green shield bug Palomena prasina in the autumn.